The International Atomic Energy Agency estimates that nuclear power generation facilities produce about 200,000 cubic meters of low and intermediate-level waste each year. Vital medical procedures, industrial processes and basic science research also produce significant quantities of waste. All of this waste must be shielded from the population for extended periods of time. Finding suitable locations for disposal facilities is beset by two main problems: community responses to siting proposals are generally antagonistic and, as a result, governments have tended to be reactive in their policy-making. 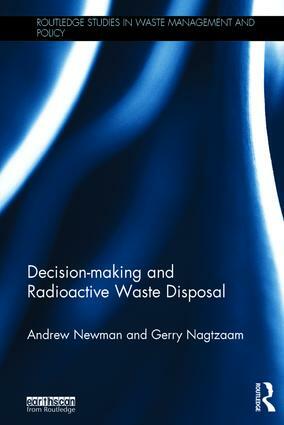 Decision-making and Radioactive Waste Disposal explores these issues utilizing a linear narrative case study approach that critically examines key stakeholder interactions in order to explain how siting decisions for low level waste disposal are made. Five countries are featured: the US, Australia, Spain, South Korea and Switzerland. This book seeks to establish an understanding of the political, economic, environmental, legal and social dimensions of siting across those countries. This valuable resource fills a gap in the literature and provides recommendations for future disposal facility siting efforts. The book will be of interest to students and scholars of environmental law, justice, management, politics, energy and security policy as well as decision-makers in government and industry. Andrew Newman is Senior Program Officer in the Material Security & Minimization Program at the Nuclear Threat Initiative, Washington DC, USA. Gerry Nagtzaam is Senior Lecturer at the Faculty of Law, Monash University, Victoria, Australia, specializing in international environmental law, ecoterrorism and biodiversity issues.